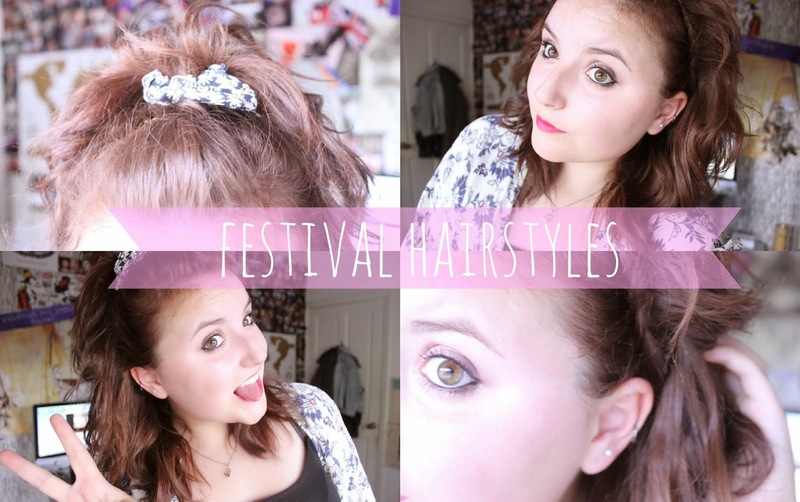 Hiya girls, recently I was contacted by Natalie to take part in a competition with House of Fraser, to share my festival hair styles and picking the products from their website of what I'd use and want to take with me. For a few weeks I've wanted to branch out when it comes to my hair…seriously it's like I know two hairstyles, hair in a bun or down, so I was really excited to use this as my chance to experiment with my hair and well any excuse to think of shopping for new hair care products! I should probably use this time to mentioned that I haven't been to a festival and unfortunately I won't be going this year, but I love the idea of camping out, seeing my favourite bands (and discovering new ones), while spending my time with my friends and wearing festival 'appropriate' clothing. So this is very much how I'd like to wear my hair when at a weekend festival, and ways I'd manage my hair with a lack of showering! For day one's hair style, I'd realistically want to make the most of clean hair and being given the chance to do my hair before leaving…which means getting full use of a shower, hair dryer and straighteners. So for day one, I have loose waves, while combining the idea of braids/plaits into my style. Recently adding something like plaits to my hair seems like the perfect way of making my hair a little more summer appropriate while being simple. As this is a basic hair style, I could continue to use this style over the weekend and is manageable for different hair types or desired styles, this could be created with thinker or thinner hair, straight or curly or even leaving plaits in over night for a more 'beach wave' look. I personally just prefer my hair being curled as it gives it more volume and style…it flattens out after a while anyway! For my plaits I've taken small sections from just behind my ears, creating small/thin plait…which would be much thinker if I had thinker and longer hair. Wrapping both plaits over my head to meet, using hair grips to keep them in place and hiding the meeting by also pinning my fringe back too. This way I'll be keeping my hair out of my face and using very little accessories to do so. To keep this style in place I'd use my toni&guy sea salt texturising spray, to create a little more volume before using probably too much hair spray. Because day ones hair style, I'd be hoping that my hair would sill resemble a few loose curls just to keep my hair looking slightly alive, however whether my hair would have stayed in place or not, my second day hair style would definitely involve an up-do of some kind and lately I'm loving the top knot…half up/half down as my nan calls it! But again for another basic hair style I'd have something that resembles this, purely for ease and apart from choosing an outfit & a touch of makeup, it would literally take me seconds to get ready for the day ahead. For this style, again it doesn't matter about original hair style or type this is something simple everyone can use, when creating this look myself I prefer adding accessorises. One I always use is a scrunchie, it lifts my top-knot a little more and adds a little more volume to the overall style, a very 90's look too! If I owned more hair ware products I'd wear this with either a floral crown or even head jewellery just to add more detail into the look. Compared to day one's style this look involves very little product wise, though I'd possible sleep in plaits for extra waves & add a little dry shampoo and texturising spray to add volume. Ive already mentioned the products I'd use for these, but I'd definietly make sure to pack smaller travel sized dry shampoo and texturising spray, which I could use throughout the day & each morning. While recreating these style I popped over the House of Frasers website to look at their hair care products to use, while I wish they had more option I came across Aveda Control Force firm hold hair spray. While my hair can be very lifeless and easily becomes flat without at least half a can of hair spray, this is the products I'd use from them to do so, mainly because I like finding new hair sprays (not all of them work on my hair) and it looks like a compact sized can which I could easily pop into my bag and I can use to easily top my hair up throughout the day. Love this post, both looks are really cute. I had never thought of doing braided headbands like that, I normally opt for a braided hairband but can't find any in my colour now that I've redone mine, so will definitely try this way out!! Ah you're making me want to cut my hair!